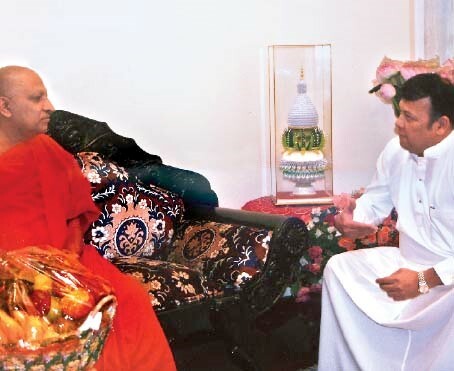 LankaWeb – MAHANAYAKE THERO HAS NOTHING ELSE TO DO OTHER THAN MEETING OVERGRWON FAT POLITICIANS ………. 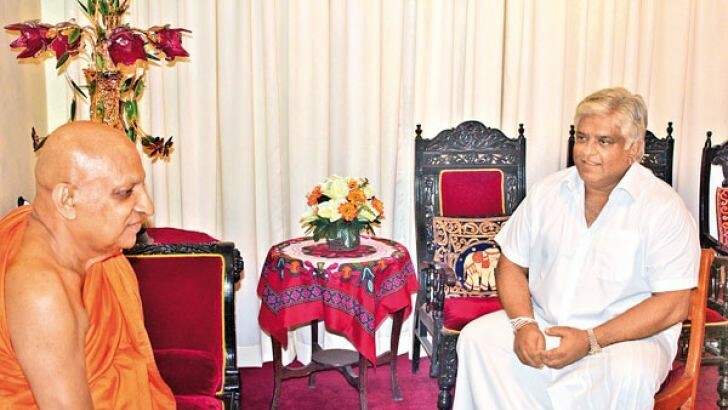 MAHANAYAKE THERO HAS NOTHING ELSE TO DO OTHER THAN MEETING OVERGRWON FAT POLITICIANS ………. We see many politicians ( some overgrown) sitting in front of the prelate and trying to get blessings from Mahnayake Thero .One good thing is that Mahanayke is always polite ,accommodating and kind in giving advises to all the politicians .Lately this action has become a fashion . I heard one powerful minister was asked to consider opinions from the Public regarding handing over of a port to Chinese and the Minister replied that they will seek approval from Parliament before implementing. Of course parliament with a majority for the ruling party can do anything as they wish. In one occasion Mahanayake Thero told Finance Minister that his work was appreciated by foreign organizations and an award was also given, but Sri Lankans have failed to appreciate his work ! ( I am not sure about the response from the minister –but rejection of certain budget proposals is clear indication of the popularity of the finance minister!). Another minister went to see the prelate to get advice about SAITM and Thero said that government should listen to doctors also ! Newspapers fill these shows with nice photos and TV crew also create news . Ataprirkara traders in Kandy are also making big money ! I do not think that these shows does not make any impressions among the public when they watch this in TV or read the newspapers. Last one is the worse. My get swine flu. These Mahanayake’s living in their IVORY TOWERS seem to have lost touch with the common people and forgotten that their PRIMARY DUTY is to protect the Sinhala Buddhist community and foster their Buddhist faith. They are TOO BUSY PANDERING TO POLITICIANS on all sides of every issue to PRESERVE THEIR PRIVILEGES no matter who comes to power, that they FAIL TO SEE that the Sinhala Buddhist Community on whom their position ultimately depends IS DYING from their NEGLECT! They have to LEARN to STAND UP and PROTECT the Sinhala Buddhist Community NO MATTER WHAT THE CONSEQUENCES to them personally are, because if they do not they will LOSE the LOVE & TRUST of their own people. Once they LOSE that LOVE & TRUST, they will have LOST IT ALL, no matter how many politicians they have sucked up to! I say to the Mahanayake’s Theros: STAND UP for your PEOPLE & your FAITH without sitting on the bloody fence! I really don’t see the importance given to these two Mahanayake’s. They have no clear stand with respect to Buddhism and the Place of Buddhism in Sri Lanka. They are not politicians and they don’t have to seek the vote of ordinary Sri Lankans to occupy the all important posts of being the custodians of the Temple of the Tooth and all the lands and properties that is bestowed to the Temple by our kings of yore! They should be able to express their considered views, and most importantly about the Buddhist Establishment in Sri Lanka without fear or favour! They are a shame to Buddhism, the Sinhalese and Sri Lanka! They have become mainly politician pleasers, especially the one from Malwatte is very partial to the UNP and its Anti Buddhist politicians. Recently when he met Ravi Karunanayakam, he was surprised why the ordinary Sri Lankans couldn’t appreciate him being the best Finance Minister in the world, suggesting that he is the best and the people do not know what is best for them. Lord Buddha spent his 45 years of life after Enlightenment, preaching the Dhamma. Is there anybody in Sri Lanka who has listened to a simple Bana Sermon from these two worthies, let alone giving protection to Buddhism, while being the custodians of the Temple of the Tooth! It simply shows the depths to which the place for Buddhism has sunk in Sri Lanka! The Wisdom of the Ages is with the Chief Priests. There is a time to speak and a time for silence. They know that. The country is in some turmoil as some foreign countries earlier tried to virtually take over Lanka. Lanka needs to be stabilised again. Power must be with the People of the Land. Two of their best have been sacrificed at the alter of politics, i.e. Rev Soma Thera and Rev Somawansa. Politicos do the age old practices of gaining the Blessings of the Buddhist Chief Priests. That is tradition and that is right. The old Colonial ‘divide & rule’ must go !! Add : Rev Sobitha too. He said to MR who went to his bedside : “Vade varaduna, Mahathayo” …..
Opps ! error – pls remove “Rev Somawansa”. I must say that the Mahanayake on the first photo is a genuine person who seem to be well aware of the world we live in.He is the present Malwatha chief. I knew him personally from 1980s when he was the chief priest at Ridhigama temple where I had my big coconut estate on the other side of Dadduru river. to thank me for giving a army lorry load of coconuts to his camp at Polonaruwa.Sadly that was our last get together. Can you site a few things the Thibotta – Bathgotta has done to improve the stock of Buddhists in Sri Lanka. I believe you are a Christian and your comments are no further from those of the Christian Church. Good effort trying to paint a black sheep while! This entry was posted on Friday, April 7th, 2017. You can follow any responses to this entry through the RSS 2.0 feed. You can skip to the end and leave a response.